Interface Arts: Priceless or Worthless? “Hana, what you don’t seem to understand about modern, abstract art is how stupid the concept is. Someone makes blocks of colour on a canvas that a child could reproduce, but apparently it’s worth millions because we attach some arbitrary ‘meaning’ to how the blocks are arranged and think it is soulful and insightful. Actual artists who have the skill to paint something worthwhile are being passed over in favour of the guy who spilled paint on the canvas. So the question is, ‘what is the Christian response to a comment like this?’ Is this kind of abstract art ‘meaningful’? Is it worth £47.3 million? Well to answer these questions the best thing to do is ask some more questions. Here are three simple questions that can be applied to any work of art that will help us to form a more grounded opinion than that of the person above. Who? Who is Mark Rothko? What is his view of the world (religion, culture etc)? Mark Rothko (1903-1970) was a Russian-American Jewish painter. He is classified as an abstract expressionist, although he himself rejected this label and even resisted classification as an "abstract painter". He was influenced by artists like Paul Klee and Georges Rouault. He was influenced by two world wars (as a Jew) in his lifetime and the philosophy of Friedrich Nietzsche. What? What is the painting about? What is Rothko trying to achieve by painting this picture? Evaluate! Is it Successful? Does Rothko say what he’s trying to say well? From a Christian point of view what is good about his work? What is bad about his work? Rothko is clearly interested in human feeling and emotion. In the painting above he uses a simple language to communicate a human experience that goes beyond words. He is interested in the experience of something higher and more profound. Rothko offers to share with his viewers an experience and in my view he does it very well indeed. If you have ever stood in front of a Rothko painting you will know that they are very powerful. They do make you feel something. They are more than simply blocks of colour on a canvas. But what do we make of this painting as Christians? Well, it is good because it places high value on elements of Gods creation - colour and form are prized. It also suggests there is great meaning in these elements of creation and that beyond them is something (or someone) greater. Rothko may not have believed in the God of the bible but he did recognise and honestly communicate his experience of life. So, from a Christian perspective Rothko is interested in good things but rather than seeing God in those things (in colour, form texture etc) and turning to worship, he indulged in a personal ‘religious’ experience. 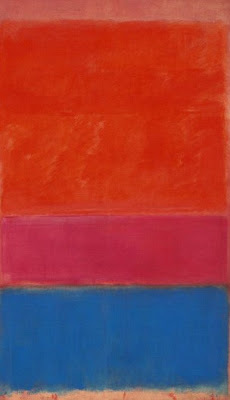 So in my view, Rothko’s painting is good. It is very insightful and valuable. Is it worth £47.3 million? I’m not sure about that! My answers to these questions are brief but you can see that very quickly your view of a painting can change just by doing a couple of simple Google searches!